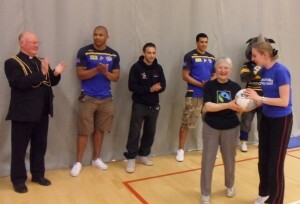 Leeds Rhinos players took part in the multi-faith InterActive Sports Day held at Leeds Met University on March 29th. There was a great day of sporting activities and ‘global bingo’ organised by Fairtrade Yorkshire’s Hannah Dalrymple. Fairtrade refreshments were provided by Fairtrade Leeds. 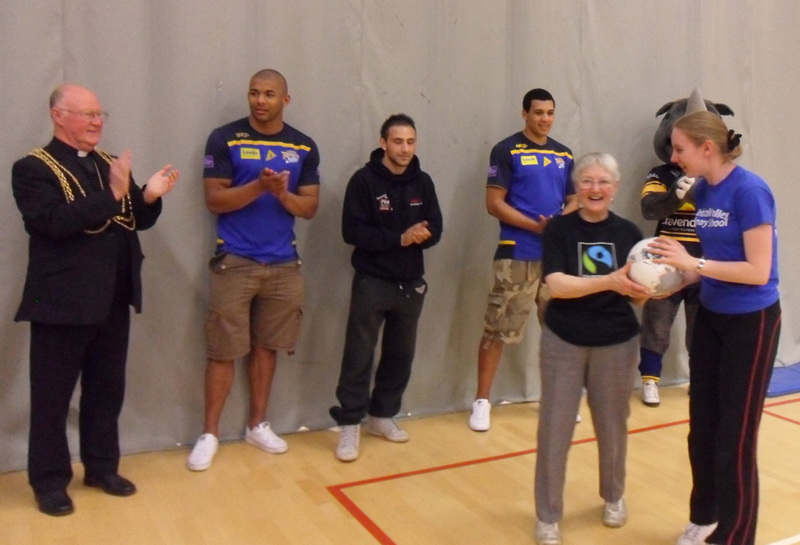 Medals were awarded by the Lord Mayor of Leeds and Leeds Rhino’s team players. Fairtrade activist Cynthia had donated a Fairtrade football which became a lucky draw prize, won by Kirkstall Valley Primary School. The theme for Fairtrade Fortnight was Take A Step for Fairtrade to make the world a fairer place with lots of Crofton residents joining in to do their bit. Cynthia Dickinson of Wakefield Fairtrade steering group, took assemblies in the three primary schools using the story of a Fairtrade football. 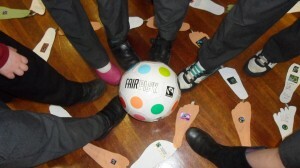 She then asked the children to draw footprints and collect Fairtrade marks over the following couple of weeks. The result was amazing and Cynthia was delighted to revisit the schools with certificates and prizes (footballs and chocolate) for participating youngsters. Shay Lane Primary School children produced a staggering 1312 footprints. Meanwhile older residents made Footprint Pledges to support Fairtrade. Thanks to librarian Lynne Loy and library staff, hundreds of footprints from school children, library users and local groups such as Crofton Mothers’ Club, Community Cafe, Reading Group and Darby & Joan Club, were on display in Crofton Library.